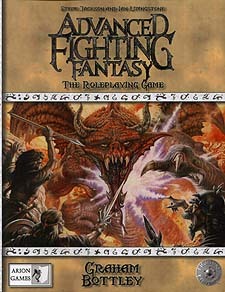 A complete Roleplaying Game in the classic Fighting Fantasy World. Let your imagination take you to Firetop Mountain or the Forest of Doom, and have new and exciting adventures. Advanced Fighting Fantasy is perfect for those completely new to gaming and veterans alike, and will provide many hours of fun! A very good introductory-level RPG. It builds on and expands the world in the classic 'Fighting Fantasy' gamebooks, which I loved in my younger days and, indeed, still like! It's fast and simple, but with good, i.e. comprehensive options, for example on the variety of spells, special skills and / or religions etc.. The book is good for the price, though the supplements in the series are undoubtedly useful. The writing and the rules are clear. I have no complaints myself but it may appeal more to folk who were keen on the style of the original books. It 'modernises' and updates the Fighting Fantasy world while being true to its ethos and providing continuity for the brand. A sound purchase. Simple and straightforward, yet effective and engaging.